The troubles continue for EA, who have been having nothing but problems since Star Wars Battlefront 2 launched. 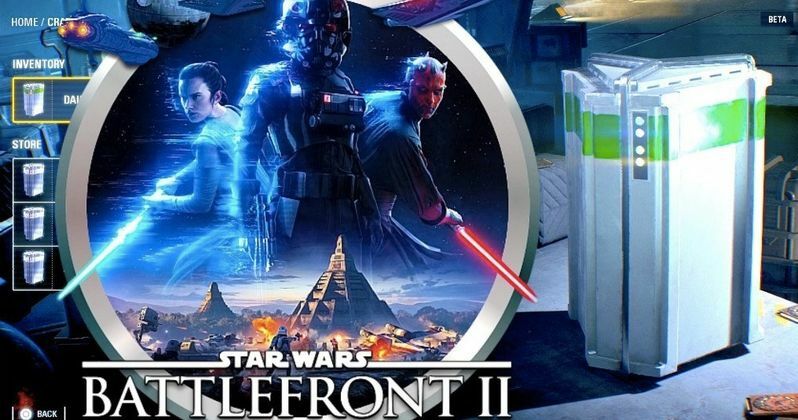 What was supposed to be a dramatic improvement over the disappointing first game has turned into a total fiasco, as the company's loot box system, which pretty much translates into a "pay to win" system for players, has come under intense scrutiny. Now, state legislators are getting in on the action, accusing EA of exploiting young gamers. Hawaiian state Reps. Chris Lee and Sean Quinlan have come out publicly to take action against these monetary practices in Star Wars Battlefront 2. Specifically, the legislators see the game's "online casino" as particularly exploitive to young kids who may not have the "cognitive maturity" to understand they're possibly being taken advantage of. Here's what Chris Lee had to say in a statement to the press. "This game is basically a Star Wars-themed online casino designed to lure kids into an addictive cycle of gambling money for a chance to win game upgrades. These exploitive mechanisms have no place in games being marketed to minors, and perhaps no place in games at all. Nothing currently prevents EA from exploiting people buying loot crates with random contents through microtransactions because there is no requirement to disclose the odds of winning something meaningful, and companies like these are allowed to specifically target youth without the cognitive maturity to know when they are being exploited." This issue is incredibly complex and goes far beyond Star Wars Battlefront 2. Microtransactions have become an increasingly popular way to further monetize games, that already typically cost $60 or more upon release. In the case of Battlefront 2, their lootcrate system makes no guarantee of what the player will receive for their money. These crates, which contain upgrades that give players an advantage during gameplay, can also be earned by playing the game, but that takes a significant amount of time. So, many players may choose to buy the crates. But, as Chris Lee points out, for younger gamers, that could be particularly problematic. Lee noted in his statement that the Attorney General has already been contacted. "We have already asked the Attorney General to look into this situation. We are also looking at legislation to protect families by prohibiting the sale of games with these gambling mechanisms to those who are underage, or prohibiting these gambling mechanisms altogether. We know it will give families who have been victims of these predatory practices a sense of pride and accomplishment to have worked to prevent future exploitation and we have been working both with them and legislators in other states who are also considering ways to address this important issue." Microtransactions aren't inherently bad, so the idea of banning them altogether could have a bigger effect on the gaming industry than need be. Wall Street analyst Michael Pachter doesn't agree with the arguments being presented. "It can't and the legislators are morons. 'Gambling' requires a wager to win something of tangible value. If the thing won can't be sold or monetized, it isn't gambling. Period. Morons. Should resign immediately," Pachter said. As far as EA goes, following angry gamers on Reddit complaining about the lootcrate system, and some death threats, the company decided to turn off the in-game purchases. For now. "It's clear that many of you feel there are still challenges in the design. We've heard the concerns about potentially giving players unfair advantages. ... Sorry we didn't get this right. We hear you loud and clear, so we're turning off all in-game purchases. ... The ability to purchase crystals in-game will become available at a later date, only after we've made changes to the game." This situation is getting increasingly complicated and doesn't look like it's going to be resolved anytime soon. The frustrating thing is that Star Wars Battlefront II is, in many ways, a much better game than its predecessor. But that's been overshadowed by this loot crate controversy. Now, the government is getting involved. You can check out legislator Chris Lee's full statement in the video below.